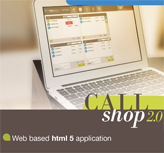 Callshop is a simple and comprehensive solution for facilities allowing customers to make low cost international calls. It is fully manageable through a comprehensive web interface. The callshop administrator (owner) creates so called cabins which are in fact VoIP accounts associated under the umbrella of the main callshop account. A customer can make calls using one of the existing accounts (usually they are preconfigured on a PC softphone or on hardware iphones) and when finished he pays at a cash desk where a clerk checks the total sum on the web and bills the customer. The main callshop account is of a prepaid type. The callshop owner has to make some deposit in advance to their provider or the provider’s reseller. The prepaid system works in real time guaranteeing that callshop accounts will not go negative.